Earlier this year, I wrote about the Maple and Clove Runners Group. Since that first time I went along it’s quite honestly changed my life, and the inspiring Deanne Brennan is one of the big reasons why. Dee is one of those people who you meet and instantly want some of what they’re having. A self-described “coach, facilitator and optimist”, she has qualifications in Health Science and Professional Life Coaching. 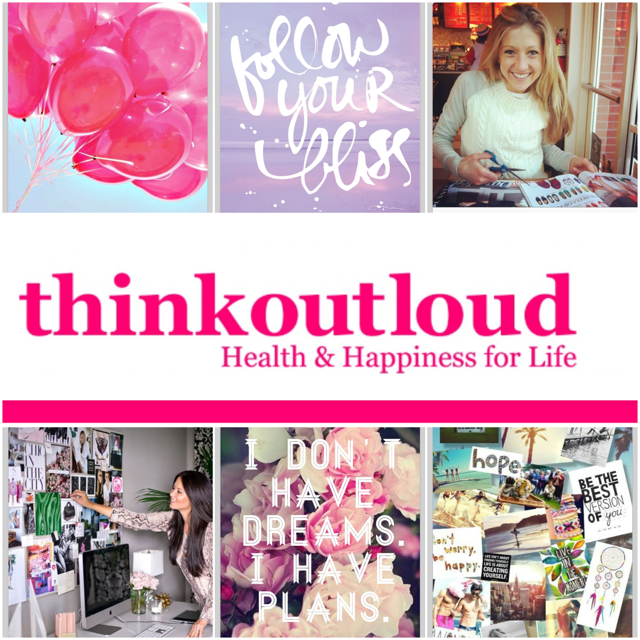 Her business thinkoutloud specialises in supporting ambitious women in their personal and professional lives, and I can tell you from experience that she’s exceptionally talented in achieving just that. Over a coffee after Runner’s Group, Dee kindly invited me along to attend a thinkoutloud Template for Life Vision and Goal Setting Workshop. I jumped at the chance, not only to road test it for readers but also because I’d been feeling a little ‘blah’ and overwhelmed in life and it sounded like just the thing I needed. The Workshop was held at Power Yoga Canberra, a gorgeous light filled space above the busy streets of the city. I took along one of my girlfriends and we were introduced to the other three woman as we took our places on yoga mats on the floor. Dee ran us through the days program which would feature a guided visualisation meditation, listing our goals, dream and possibilities, crafting our own vision boards and writing up our ‘template for life’. Before we started, we were asked to separate into partners and ‘thinkoutloud’. This involves facing each other and taking turns to speak for two minutes with no interruptions – no questions, no reactions, just listening. As I was doing this with a close friend, it really made me aware of how often we unintentionally interrupt each other or steer the conversation. It can be quite startling to realise what people have to say when you’re not interrupting and asking questions. Sure there are moments of silence, but that’s ok – it was interesting to find that it’s after the silence that the deeper thoughts or feelings are vocalised, where we probably would have interrupted in an everyday social setting. Next came the meditation. Laying on yoga mats on the floor, Dee started a soothing guided visualisation where we imagined ourselves in the happiest and most fulfilling life possible. Some women in the group experienced surprising imagery of things that they hadn’t even fully realised they sought. This is a really powerful tool for connecting with your subconscious and reflecting on what makes you happy. The meditation primed us for our next task of dreaming up our lives 5-10 years from now. For me, that included being active and healthy, living in a beautiful home, happily married with children, working from home writing and spending time with family. I’d always recognised that these were things I’ve wanted, but the combination of power visualisation and putting words down on paper really cemented in my mind that are the things that I wanted to work towards. For me, one of the things that really struck a chord at the workshop was talking about breaking down bigger goals. Dee encouraged us to think about what our big, long term goals looked like, and what sort of feelings that we wanted from getting them. Obviously this is different for every individual, but for me (like many women) it’s the ‘white picket fence’ dream, as I’ve described. I dream about the security, happiness and love that that would bring. What Dee suggests is taking those feelings, and making sure that we regularly do things for ourselves that grant us those same feelings. For example, a lazy, cuddly weekend sleep in with a loved one might not be on quite the same level as buying a house or having a baby – but it does give you those same feelings of love and security, albeit on a smaller level. Next came the fun part: creating our vision boards. If, like me, you were seriously into collaging as a kid then you will love this. Even if it doesn’t sound like your thing, trolling through magazines and choosing images that you connect or identify with is another great tool in creating your template for life. It was wonderful to chat and connect with the other women in the group over our clippings and glue, and when we had finished it was startling to see how each vision board was so different yet so beautiful. My vision board sits above my bed and reminds me daily what’s important to me and to reach for my personal goals. And I have to say, I really genuinely believe that it’s working. Since then I’ve ticked a few of my boxes and my life has definitely improved. It’s a really useful way to remind me what’s important to me when I get caught up in the dramas and minutia of day to day living. I couldn’t recommend this workshop and Dee highly enough. Whether you attend one of the monthly workshops or opt to have your own private coaching session, you’re sure to find inspiration, motivation and importantly, a bit of direction. Plus, Dee’s deliciously nutritious chocolate bliss balls are to die for! Ashleigh Went is a recent communications graduate from the University of Canberra. Part time health and fitness fanatic and full time lover of our gorgeous city, Ashleigh is passionate about arts, fashion, travel, books and champagne.